For years I’ve attended Paper Shows—I have a weakness for paper ephemera: old photos, postcards and artwork for collage and painting inspiration. And I always take the opportunity to look for childhood favorites to add to my collection of Hallmark storybook and international cards, Golden Books, Calling All Girls magazines and Classic Comics, later Classics Illustrated, a forerunner of graphic novels. One thing I haven’t been able to find is a companion book to an animated film I dearly loved as a child: Johnnie Fedora and Alice Bluebonnet. I’m old enough to remember when cartoons accompanied the feature film(s)…. Note I wrote films. I still haven’t gotten over feeling cheated/unsatisfied by today’s movie theaters showing only a single film per price of admission. When I was a child there were two films plus one or more cartoons plus a newsreel plus previews and maybe a serial installment (no advertisements!) I’m spoiled forever apparently. I’ve looked online for the book also, but never found it there either. Recently—eureka! I found the film on YouTube. Although it perhaps doesn’t have the same charm it possessed for a 4-5 year old, it’s like an old friend—maybe a bit dated, but still loved. I believe most of us have a soft spot for our childhood passions and, yes, I do feel something of that passionate complex childhood joy has remained. The romance, the tragedy, the tears and the fear of a sorrowful ending, the joy of the happy conclusion--it has everything a good book should have! It was an early (child size) lesson in telling a story. 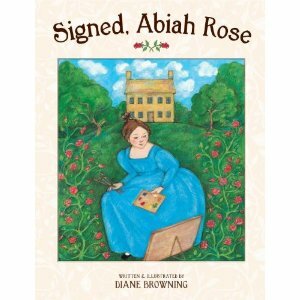 It made a huge impression on me, like my Hallmark cards and my favorite picture books. They helped plant the seeds of appreciation for a lifetime love of books, film and art. I love them still for the happiness they gave me and the part they played in the life I had as a child. Whether they saw it many years ago in theaters at kiddie matinees or quite recently on TV, there was a similarity in the comments. So this little film still inspires love and passion. I wonder what other artifacts of childhood are being dreamed about and searched for—having inspired a lifelong devotion. In a series of lectures a decade ago editor Jason Epstein predicted a future where out-of-print books could be printed on a machine small enough to fit in a retail store. He soon found out that there was a new prototype for such a machine already in existence, and he and partners founded On Demand Books and set about developing the machine. Today there are 21 Espresso Book Machines in the United States and 25 abroad. And one of them is now at Flintridge Bookstore. For this month’s Writer2Writer meeting we had a special speaker - Grant Paules, the technical manager for the Flintridge Bookstore. (They moved in February to their own newly-constructed building, just up the block from their former site.) Grant has been with the bookstore since it opened in 2007. He’s a computer expert and consultant as well as manager of the coffee house part of the book store and general all round tech person. 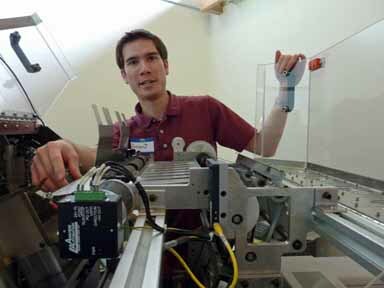 Grant treated us to a talk and demonstration of the bookstore’s new Espresso Book Machine. 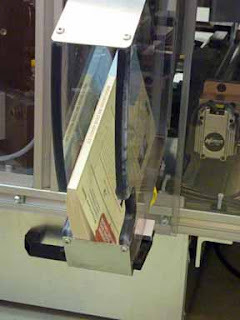 It’s an amazing machine, printing and binding a finished book in approximately five minutes from loading paper to finished book, complete with shiny color cover—virtually identical to a paperback book from Random House or HarperCollins. Grant had to learn the ins and outs of the book machine with only eight hours of instruction, and now is able to both operate and repair it. There is very little room for error, but he now feels comfortable with its intricate and precise workings. His talk was very interesting and informative. 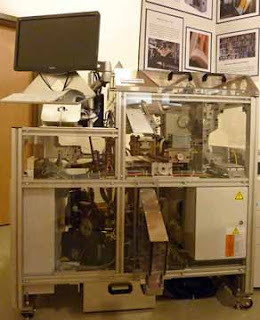 The book machine can print books from the bookstore database, offering millions of in-copyright and public-domain titles. For self published books, the bookstore offers a range of development prices and options, from formatting content to obtaining an ISBN and copyright. Pricing per book (beyond the initial printed proof) depends on the page count and choice of paper—cream is heavier, and more expensive. Book dimensions (which range from minimum 4.5” x 5” to 8.125” x 11”) are dependent on page count also, as more pages make a thicker spine which takes up more of the cover. And they’ll print one book, or hundreds. 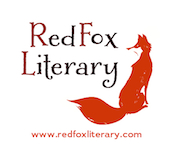 For a self published book you can supply your own cover art, blurbs and your choice of font by sending all the information in a Word file. Grant will supply formatting guidelines. The cover can be in color but the bookstore’s machine at present cannot print the interior in color, though hopefully that will be an added feature next year. 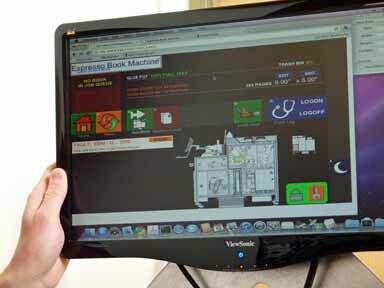 Grant can work locally or even long distance to complete custom projects. My fellow blogger Lupe, on Pen and Ink, has also written about Grant’s presentation and more information is available from the bookstore. Grant can be reached there at grantp@flintridgebooks.com. Watching the book machine at work was fascinating, and I’m happy that one is located in the Flintridge area of Los Angeles. And even though I have no plans to self-publish at present, I’ve found myself toying with the idea of other personal printed projects—family genealogy, my European diaries, the text blocks for my sister’s hand bound books. There are lots of fun ideas floating around! I always enjoyed my mother’s stories of her childhood. I was very impressed when she told us she had set out to read every book in the children’s department of her small Oklahoma library. (And she succeeded!) I wanted to do the same, but my big city library did contain more books, I told myself, and I never matched her record. My mother had obviously spent a great deal of time in the library and was allowed as a child (for a special treat) to visit the basement to look at antique books and magazines that were stored there. When my older sister was a teenager she worked in our city library and was allowed similar access to books. 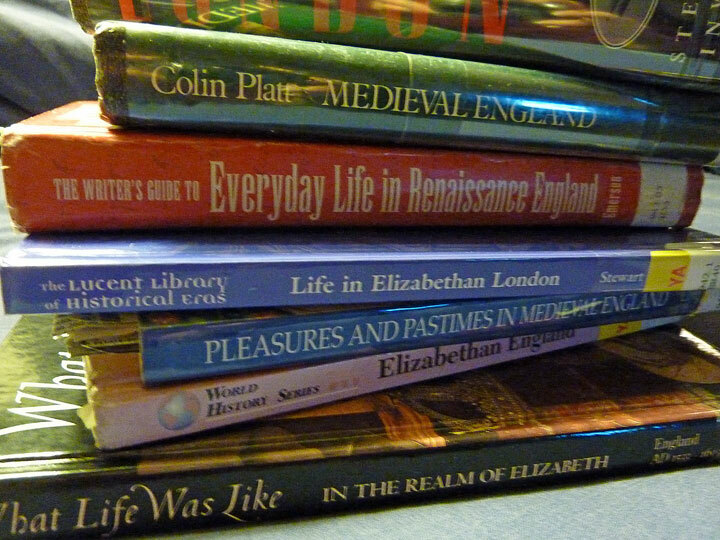 She was also given some discarded books and vintage magazines. We loved what she brought home and marveled that they would eliminate what we considered treasures. I didn’t yet understand the concept of limited space! Actually, it still bothers me that libraries must periodically eliminate older books to make room for current ones—where are some of my favorites from long ago?! But there are still treasures to be found in our libraries. Perhaps we do not see them as quite so magical as we did as children, but a visit to the library is still a special time to me and going home with a stack of books is still a joy. Hurray for libraries! I Celebrate National Library Week -- and Cats! This is National Library Week and I thought I would combine my celebration of libraries with my on-going celebration of cats. One of the things libraries do best is introducing us to new favorite books–books we missed when they were first published perhaps, or older, out-of-print books, or books which we love so much we decide to go purchase them. 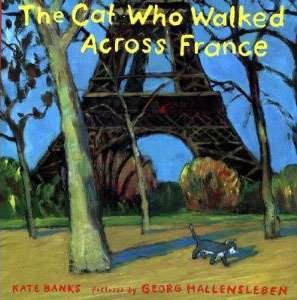 My new favorite library find which fits in this last category is The Cat Who Walked Across France by Kate Banks and illustrated by Georg Hallensleben. This charming picture book brought to mind my own experiences with cats I have met in my travels in Europe. The outrageously spoiled English cat (who traveled from one hotel guest’s room to another, receiving treats) and the Swiss ‘therapist’ cat I met in a meadow in Gstaad (who definitely understood English and had a very soothing and comforting demeanor) seemed very happy and secure. The little grey cat who walked across France had once been a loved and contented companion but had been displaced after the death of his elderly mistress. Taken far from his home in the south and unhappy and ignored in his new home, he remembered “the tangy smell of lemons ripening on a branch under a window at the stone house by the sea” and began his long walk home. After a difficult journey he finally did find his old home again, and new companions there to care for him. The title alone had attracted me, but the book has gorgeous bright, painterly illustrations that remind me of the work of post Impressionist French painters. It’s a simple and poignant story of regaining a home and love seemingly lost forever, and I was delighted by it. Libraries are filled with old favorites and new discoveries --a treasure trove of books -- and one week is too short a time to celebrate them!